Ancient Stones - Borders - 030 Rubbing Stone, The Inch, Ettrick. 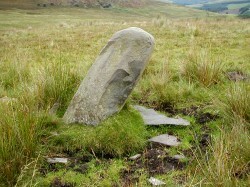 This stone stands on a flat area of high ground about 50m from the B7009 Selkirk to Ettrick road. It stands at around 1.20m high with a base of 0.50 x 0.30m tapering to approx. 0.30 square at the top. 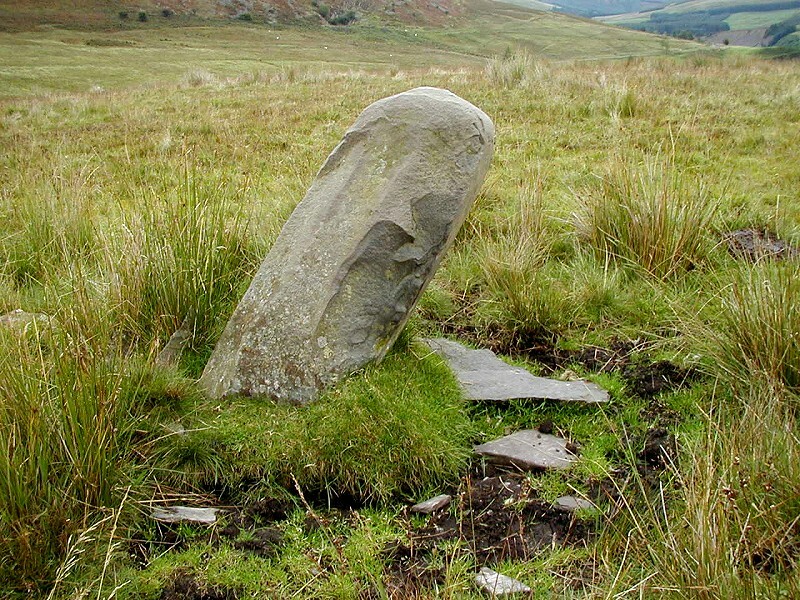 The rubbing stone is set in very boggy ground which is probably the reason for its south-west lean and has some other smaller stones close by, one of which appears to be set on end. From Selkirk take the B7009 road leading to Ettrick. Continue through Ettrickbridge End. The stone is on the west side if Single Hill, just before The Inch. On verge at roadside. A small lay-by can also be found about 0.50 miles towards Selkirk. This stone is probably a rubbing stone used by livestock to relieve that difficult to reach itch. However, at first sight the setting does appear typical of that seen at some pagan wells and although the ground is wet and muddy, perhaps indicating a spring, this is probable only due to livestock churning the ground. However, the stone is located on a raised area of ground with good views of the valley, typical of that found at many standing stones and circles.